Consulting Club – Calling all Majors! 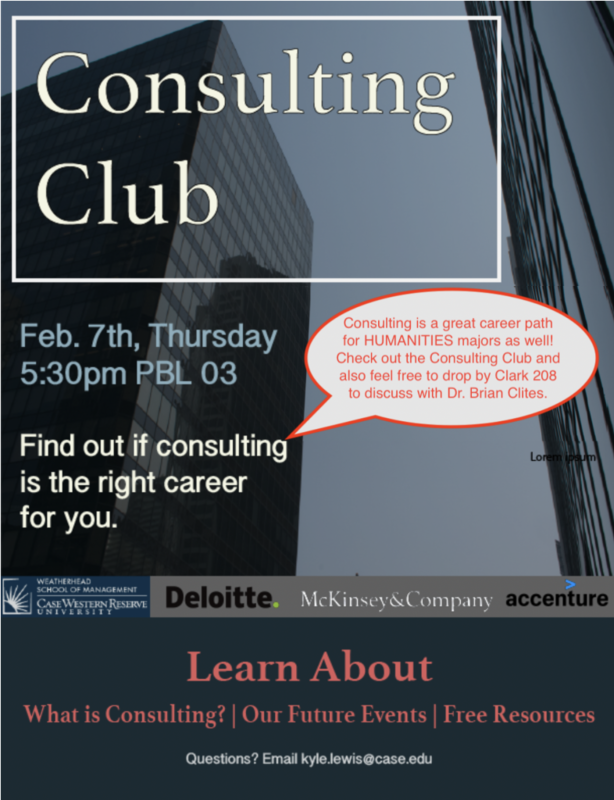 The first meeting of the Undergraduate Consulting Club will be Thursday, February 7, 2019, 5:30 p.m. in PBL 03. This is open to undergraduate students from ALL academic disciplines. In this first meeting they will introduce consulting (e.g., what is it) and why it is a viable career path for our students. They will also talk about their plans for the remainder of the semester. Anyone with curiosity is welcome to attend. Consulting recruitment is one that starts very EARLY – July – and is often wrapped up by October. The interviews, both personal experience and case, require a great deal of preparation, which means that students are best positioned when they go into summer knowing what they need to do to prepare. Our students have great ability to succeed in the interview and the consulting field given their desire to solve problems and their ability to conduct research, perform analysis, and communicate ideas verbally and in writing. If you have questions about the consulting club, please contact Robin Hedges. If you’re not sure about consulting but want to discuss your future career planning, please drop by one of our Humanities-Meetups this Spring!